Stradivarius wins the Goodwood Cup! And it's a hat trick for Andrea Atzeni! 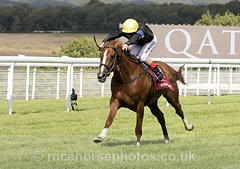 Stradivarius, with a 13lb weight allowance from the older horses, won the Group One Qatar Goodwood Cup for trainer John Gosden and owner-breeder Bjorn Nielsen. Trainer John Gosden said: "Frankie controlled the race on Big Orange, he came up the middle, he didn't want to be attacked hard down the rail. It was clever of him, but our fella stays well. "Andrea was very confident beforehand, I asked him if that was because he got in a muddle in the first and got the next two right?! He said no! "But it is full marks to Peter Shoemark, our racing office manager, he was the one who suggested the entry to me, I said are you mad? "But I thought about it and thought hang on, actually he has to give weight with the Group Two penalty from the Queen's Vase win, and running in anything else such as the Voltigier or a handicap he's have the penalty. So, I thought you're right to come here and this is Peter's victory not mine. "I don't think the three-year-olds have an enormous advantage - Enable is a brilliant filly and this is a proper stayer, you can't come and do it without a proper horse. "He goes straight to Donnie, goes there nice and fresh."